Once upon a time, in a faraway land, a beautiful pumpkin was born. The French vintage “Rouge Vif d'Etampes” pumpkin (sometimes spelled Rouge Vif d'Estampes) is also called the Cinderella Pumpkin because of a legend that this variety was the model artists originally used to depict Cinderella’s magical pumpkin coach. Its beauty, novelty and history make it a fun crop to grow, whether added to a larger pumpkin patch with many other varieties, or grown as a specimen crop. This heirloom often sells well at farmers markets and catches the eye as a decoration for homes and businesses. Although many agree it’s best used as a fall decoration, it can also be carved and eaten when its special characteristics are taken into consideration. Like all pumpkins and squashes, the Cinderella is technically a fruit. This particular Cucurbita maxima usually matures at one to two feet across weighing between 15 and 30 pounds, with deep flame red-orange skin with yellow-orange flesh. “Rouge Vif” is French for “extraordinarily red.” Along with its exceptional color, the shape of the best Rouge Vif d’Etampes pumpkins are deeply ripped, although some develop a little smoother than others. They’re wider than they are tall, and many times the shoulders proudly rise slightly above where the stem attaches and sinks into the center. Anyone who grew up with fairytales will remember this shape as the coach that took Cinderella to meet her prince. It is also described as being similar to the shape of antique French pottery tureens. Another lesser known French winter squash, “Musquee de Provence,” also called “Fairytale Pumpkin,” can have a similar shape with even deeper lobes, but it’s sometimes taller and its final color is more of a tannish pale “cheese” color. And yet another, the Rouge d’Etant, has an attractive reddish color like the Cinderella, but so far, its seeds are harder to find. The Cinderella appears to excel all other pumpkins for its combination of shape, history, availability, and colorful brilliance. Of course, at one time, the Cinderella pumpkin variety didn’t exist at all. Its journey from its ancestral wilds and cultivated gardens of Native Americans, to its birth in France, and back home again to the Americas is a chronicle worthy of any fairy tale hero. All pumpkins originated in Central America, according to most research, although some suggests they were also native to certain areas of South America. They may have existed for as long as 10,000 years. 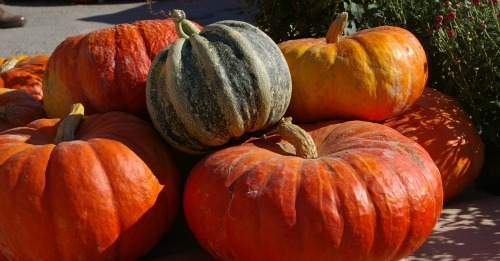 Europeans discovered them growing in Native American gardens along with corn and beans, sometimes grown in the famous “Three Sisters” companion planting method of planting nitrogen fixing beans to climb up the heavy nitrogen feeding corn stalks, with pumpkins surrounding them as a sort of living mulch. A theory of how the fruit reached the North American natives suggests that pumpkins were initially introduced from southern locations in friendly trade, and their usefulness replaced some of the previously cultivated and foraged native plants of North America. The Natives ate the pumpkin seeds as food and medicine, and also ate roasted strips of pumpkin. Dried pumpkin was even reportedly used for weaving. When Europeans arrived in the New World, they invented the first pumpkin pie by scooping out the pumpkin’s seeds and baking it filled with milk, honey and spices. Some of them also brought the Old World tradition of carving the turnips and potatoes familiar in their northern European homeland into scary faces lit with coal or candles to frighten away evil spirits. The pumpkin, they soon found, made a much better spook lantern. Pumpkins were so enjoyed in the New World, that Pumpkin seeds soon made their way across the sea to the Old World. These winter squashes eventually spread around the globe, with natural selection amidst various cultures allowing a rainbow of new colors and shapes to emerge. It is reported that some settlers believed the Natives called this autumn ripening fruit an “isqoutm squash.” The final christening of it as ‘pumpkin’ appears to have started from the Greek term “pepon,” which means "large melon." The French pronounced it "pompon," and the English language further modified it to "pumpion." Finally, American colonists began calling it “pumpkin,” and this word first appeared in the 17th century amidst a variety of literature, including a rare preserved piece entitled, The Pilgrim Pumpkin Rhyme written in the late 1600s by a Plymouth Plantation colonist, the nursery rhyme Peter, Peter, Pumpkin Eater, and that story of a cinder maid visited by her fairy godmother. The Rouge Vif d'Etampes emerged as a natural mutation and was perfected by natural selection amidst French farmers and gardeners with enough sunshine and room for the large vines to roam. Once stabilized as an open-pollinated variety, its popularity spread across France. Then in 1628, a future French writer named Charles Perrault was born. He would popularize a new genre of literature called the fairy tale, and eventually tell the story of “Cendrillon” (Cinderella). The artists of the time who depicted the story are believed to have used Rouge Vif d'Etampes as the model for the magical coach. But in the 1900s in America, many heirlooms and backyard varieties of fruits and vegetables were gradually disappearing in place of a smaller and smaller number of hybrids, and large numbers of people did take notice. A surge of interest in lost heirloom varieties ignited numerous seed saving initiatives and new independent seed catalogs to relocate and offer garden treasures of long ago. Among those that became quite popular, was the Cinderella Pumpkin. 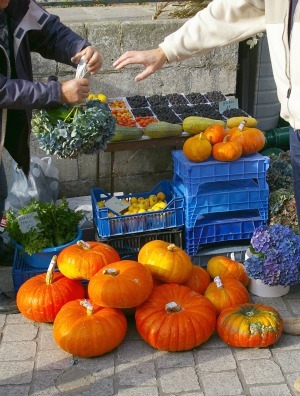 The photo to the left is a shot I took of these pumpkins being sold at a French farmers market along a waterfront during a trip to France. Cinderella Pumpkin is known more for its beauty than eating quality. Its flesh is somewhat sweet, though, but its flavor is very subtle, not really adding as much of its own flavor as other baking pumpkins to cooked or baked dishes. Keep in mind, that taste lies in the mouth of the beholder, and there are those who absolutely insist that this variety has a great taste of its own. Regardless, its taste does blend very well with other flavorings in recipes when it’s more the texture and mild sweetness of pumpkin that’s called for. We baked ours into pumpkin bread that was outstanding. In fact, Rouge Vif d'Etampes has been proudly listed as an ingredient in some American gourmet restaurants. It may have been used in these specialty eateries more for its intriguing history and romantic name, but these dishes received good reviews. Some report that it can be picked when very young as one might harvest a young summer squash, and is good fried. Though its seeds, like most pumpkins, aren’t hulless, they can be roasted and salted for a healthy snack. And if your ethnic or gourmet cooking calls for pumpkin flowers, or even pumpkin leaves as they are eaten in Africa and Asia, the Cinderella will supply both. Its ornamental shape and color stand on their own, but its more squat size may inspire new ways of carving other than the broad-faced Jack-o-lantern which is more easily cut from a smoother, taller pumpkin. Holes can be drilled in an artistic fashion, and paints can be applied in many showy styles. Or, try carving simply a small square window, then craft four carriage wheels and place the pumpkin on top. Harness up a pair of toy white horses, and set the pumpkin aglow with a candle for a unique autumn decoration that complements the October holiday of costume and make-believe, especially if there’s a human Cinderella amidst your family’s trick-or-treaters this year. 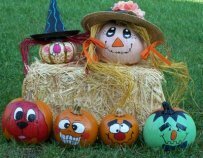 Pumpkins need a long growing season, from 90 to 120 days depending on your climate and the pumpkin variety, and the Cinderella usually needs at least 100. While many locations in the USA have a long enough season to ripen Cinderella pumpkins, they can be started indoors in paper cups or plastic pots a couple weeks before the last expected frost to help extend the season. Just don’t let them get too leggy or root bound before planting. The seeds and seedlings are large, so shallow seed trays don’t make the best nursery for your Cinderellas. Give them plenty of sunlight from the very beginning, and harden them off gradually before placing them permanently outdoors. 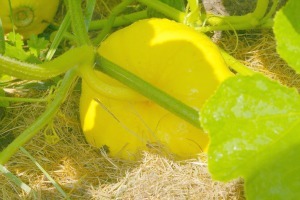 Here's a photo of a very young Cinderella pumpkin still at the yellow stage growing on our farm. The Cinderella pumpkin is a larger type, needing plenty of space, and the fruits are too heavy for most typical types of trellised vertical growing. If actual garden space is limited, gardeners have had luck growing larger pumpkins at the edge of the garden, letting the vine trail out onto the lawn, mowing around the vine as it grows. Once the vine is removed, the area is mowed again, and sometimes over seeded with new lawn seed. Your pumpkins will grow best in deep, fertile soil with lots of sunshine. Dig in plenty of well-rotted manure, compost, and test to see if your soil is ample in minerals, including calcium and magnesium. While all soils are different, the author found that rotted horse manure, dolomite lime, and small amounts of kelp made an excellent growing medium in our clay soil for healthy pumpkins. Their roots can reach far into the ground as they search for water, of which they need plenty as they are close to 90% water. Soil should drain well, though, and ‘mounding’ or ‘hilling’ is a centuries old method for growing pumpkins. This allows better drainage during over abundant spring rains, warms the soil faster during that time, and makes the soil looser and more airy. Mound up soil to about four feet in diameter, and plant your pumpkins about eight inches apart and about three plants per hill. If you’ll plant more than one mound, place them close to eight feet apart. 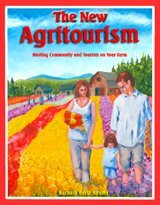 The author and others have had good luck growing nasturtiums as a companion plant for protecting from squash bugs, with the trace minerals from the kelp helping the plants themselves grow more immune to any of their host pests or diseases. Allow your pumpkins to grow on the vine for as long as possible before cutting the stem, so their full deep color can mature. Leave a few inches of stem when cutting to help the pumpkin stay fresher longer, and avoid carrying the pumpkin by the stem, which weakens it. If you’re selling your Cinderellas from your own pumpkin patch, at a farmers market or to local restaurants, the stem must be intact to maintain their full value. If pumpkins have colored up in time, some U-pick pumpkin patch growers find it useful to cut the fruits from the vine a week to ten days before customers arrive to let the pumpkins cure in the sun. If protected from extreme cold or too much indoor heat and left uncarved and intact, the Cinderella pumpkin can decorate your home from October through Thanksgiving, and become a tradition that sets the mood for autumn holidays. As the Rouge Vif d'Etampes gains popularity across America, it seems more and more natural to expect its flaming color and vintage form to appear in our harvest décor and even occasionally make its way into our cuisine. But maybe its popularity goes much deeper. Its unique shape was introduced to many of us during our earliest years in the form of an illustrated story of magic and dreams that come true. Perhaps the Cinderella pumpkin has returned to our gardens and farms to remind us that though happy dreams of long ago can seem to be lost forever, with the twirling of a wand, or the planting of a seed, they can often be restored, and grow happily ever after.